Nathalie (Isabelle Huppert) is a professor of philosophy at a Parisian high school. She is deeply passionate about her job and enjoys passing on the pleasure of thinking to others. Married with two children, Nathalie divides her time between her family, students and her eccentric mother - leading a comfortable life of personal and intellectual fulfillment. However, when Nathalie's husband announces that he is leaving her for another woman, she finds herself cut adrift. Overwhelmed by her newfound freedom, Nathalie realises that she must reinvent herself and find a new way of living. Once the credits had rolled at the end of Things To Come I was left thinking two things. performance as displayed by the superb Isabelle Huppert? 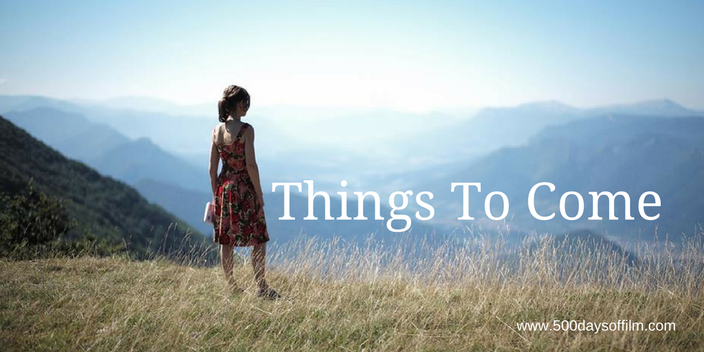 In Things To Come, writer and director, Mia Hansen-Løve, has created a wonderful, poignant and unashamedly intellectual portrait of a woman whose life has not turned out the way she planned. However, do not expect scenes of anger or despair. Nathalie is the definition of stoic. She keeps moving - even if she doesn’t exactly know where she is going. Hansen-Løve was inspired to make Things To Come by the life of her mother, Ole Hansen-Løve. Like Nathalie, Ole is a philosophy professor (she helped Mia with the scenes in the film involving philosophical debate) and, again like Nathalie, her marriage broke down when her daughter was in her 20s. However, while this in some way explains the director's remarkable insight, the power of Nathalie’s journey could not be realised by words and direction alone. Things To Come is a true partnership between Hansen-Løve and her lead actress, Isabelle Huppert. Huppert is perfect for and in this role. It is just wonderful to sit in on her philosophical debates (each handled brilliantly - never feeling dull, dry or preaching). However, it is just as enjoyable (and often surprisingly funny) to see her make her way towards her new future. Things To Come is gorgeous to look at and moving to watch - a film full of heart and soul. I watched Things To Come via Curzon At Home. I would, of course, have preferred to watch this film on the big screen. I so wish foreign language films got a wider, multiplex release. Until then, thank goodness for VOD streaming options such as these. This is not the first time that Hansen-Løve has used her family as inspiration for her films. Her last movie, Eden, was inspired by her brother. Have you seen Things To Come? If you have, what did you think of this movie? I would love to know. Leave me a comment in the box below!